A recent review article in the American Journal of Psychiatry examines data from many functional neuroimaging studies in order to define more clearly the biological basis of depression. 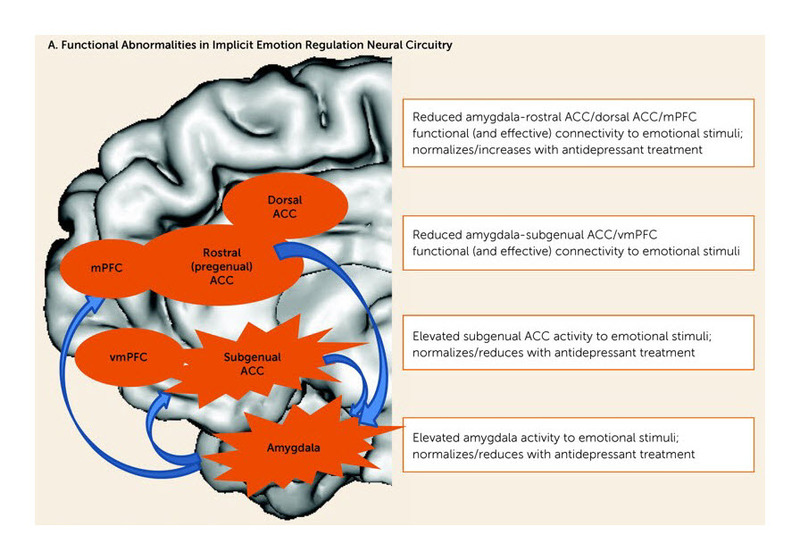 Serotonin anxiety and distress circuits that connect the amygdala and several locations in the medial prefrontal cortex. Dopamine reward circuits that connect the ventral striatum and medial prefrontal cortex. The serotonin circuit is illustrated in the picture to the right. The amygdala can be thought of as the threat or fear of respondents said of portion of the limbic or emotional brain. Serotonin signalling from the prefrontal cortex to the amygdala seems to reduce emotional response to negative information and a tendency to see threats in the world. Increases in serotonin signaling in the prefrontal cortex areas that connect to the amygdala reduces threat response. I have described the experience of low serotonin in the circuits as akin to the constant playing of “scary music” from a horror film. It’s like those moments in a horror film when everything seems normal but all of a sudden you hear the scary music and you know that there must be something about to happen. Imagine that feeling continually occurring and I think you have some sense of what abnormalities in this circuit feel like. People with abnormalities in the serotonin circuit seem to respond better to serotonin antidepressants. The most striking finding from a number of studies designed to evaluate predictors of antidepressant response is an association between hypermetabolism, as measured with PET, or greater activity, measured with fMRI, in the pregenual anterior cingulate cortex (part of the serotonin circuit) and better response to a single serotonin antidepressant (SRI). No such association was found for response to the dopaminergic medication bupropion (Little et al). The dopamine circuit is illustrated in the picture to the left. 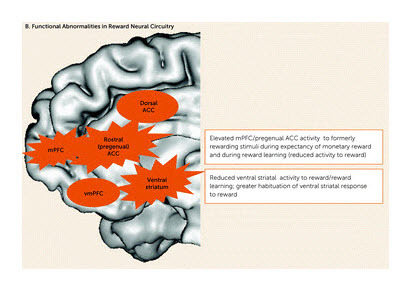 Abnormalities in the dopamine circuit seem to be associated with reduced pleasure and difficulty being motivated to do things because of the loss of anticipatory pleasure. There is less data on treatment outcomes being correlated with abnormalities in this circuit but, as I’ve noted in another post, there is some evidence to suggest that anhedonia or the lack of pleasure correlates with a better response to dopamine antidepressants. Anhedonia may be a predictor of a better response to ketamine and ketamine profoundly affects these dopamine circuits. Phillips ML, Chase HW, Sheline YI, et al. “Identifying Predictors, Moderators, and Mediators of Antidepressant Response in Major Depressive Disorder: Neuroimaging Approaches.” American Journal of Psychiatry. Volume 172 Issue 2, February 01, 2015, pp. 124-138.http://dx.doi.org/10.1176/appi.ajp.2014.14010076.